Let me get right to the point. Gold’s going to $5,000 an ounce. I know that sounds preposterous to most people. In fact, some of you probably think I’m crazy. But for a whole host of reasons, $5,000 may well end up being a conservative estimate. In 2001, gold traded as low as $255 an ounce. Within eight years, its price had quadrupled to more than $1,100 an ounce. How many investors thought that was possible, or even likely? Probably not very many. Yet, it happened. What’s more, since hitting its secular bottom back in 2001, gold has posted a positive return in every calendar year. So far, the current bull market has been pretty orderly. 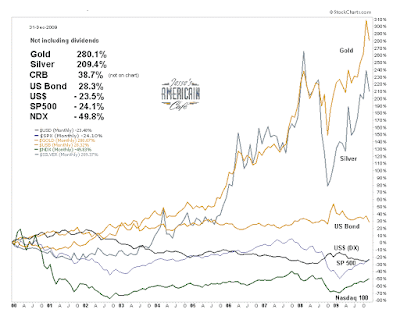 During the past 10 years, gold has indeed become the trade of the decade, beating out commodities, oil, high-grade U.S. corporate bonds, U.S. Treasuries, and yes, U.S. stocks. Owning physical Gold is an essetial part of every investment portfolio because it acts as a counter weight to the market in general. A portfolio is NOT properly diversified if there is no gold component. The weighting of gold in a portfolio may change over the years but it should be included in every diversified and balanced portfolio. Gold acts as your insurance policy against the banking establishment and political unrest. 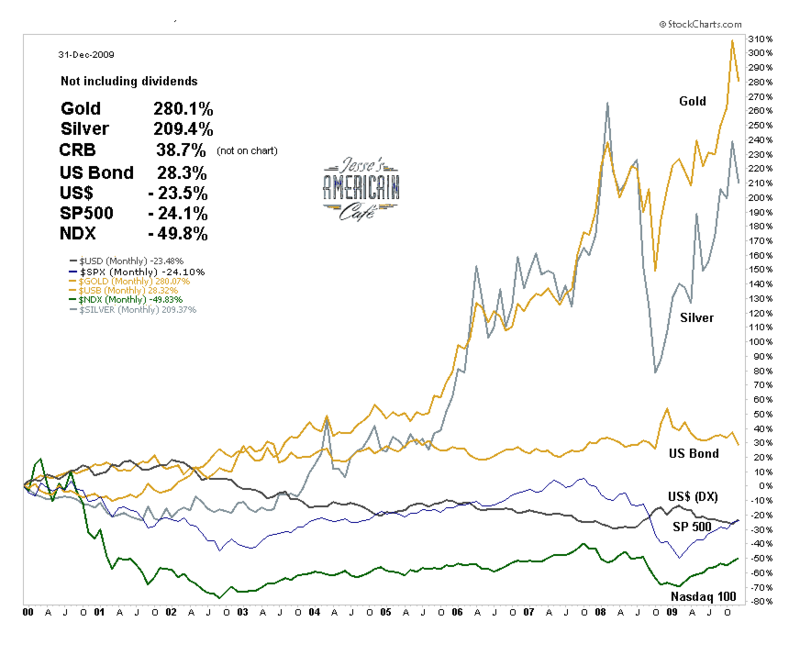 For example; if we look at the chart above we can see that just a 10% allocation to gold from 2000 to 2010 would have made the difference of your portfolio being positive or negative over a ten year period. This is especially critical for those who are saving for retirement and living on a fixed income because gold will protect your wealth from the ravages of inflation as well. Jim Rickards is a writer, lawyer and economist with over 30 years experience in global capital markets. He is Senior Managing Director at Omnis, Inc., a consulting firm in McLean, VA and is the leading practitioner at the intersection of global capital markets. Mr. Rickards was involved with providing solutions for many financial problems over the years, including the 1987 Market Crash and the LTCM crisis of 1998.